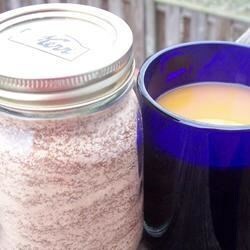 "This is an instant tea mix that can be given as a gift in a large jar. It tastes like mulled cider." In a large bowl, mix together powdered drink mixes, sugar, and spices. Place in jars. Instructions to include with gift:<BR> 1. Place 2 to 3 rounded teaspoonfuls in a cup.<BR> 2. Add boiling water and serve. Needs more tea and sugar - this is very very very tangy - we added another 1/2 C of tea and over a cup of sugar and it was much better. Does anyone have any suggestions...Tang has been reformulated and now is "ultra concentrated". I tried substituting orange cool-aid mix for the Tang and it was horrible, way too strong. It doesn't get any easier or any better than this! Everyone loves to receive this as a gift. It smells sooooo good in a steamy mug...really warms the body and the heart. Thanks Laura! Great gift idea. I put in small gift jars and placed Christmas cloth over the lid and tied with pretty ribbon. Very cute! I keep a jar of this mix in my pantry all year long. It is great on a cold, rainy afternoon with a muffin for a snack. The spices are perfect with the orange.